Remember Bloodhound? No, you don’t. I didn’t, even though it was one of my favorite DC titles coming out at the time. There were 10 issues from 2004-2005, about a prisoner working with the FBI to track those with superpowers although he wasn’t similarly gifted. It was written by Dan Jolley with art by Leonard Kirk & Robin Riggs and covers by Dave Johnson. This was a period, just before Identity Crisis and the rise of Dan DiDio, where DC was publishing things like Fallen Angel, Gotham Central, Ex Machina, the DC Focus imprint with Hard Time and the others… now, it looks like the last hurrah of diverse superhero titles. These folks had powers — or lived in worlds with those who did — but the stories were about more than just big fights. I loved Bloodhound, although it sounds like something I wouldn’t. Now comes news, courtesy of Robot 6, that Dark Horse will be releasing a collection in June. (Only it won’t include issue #5, which guest-starred Firestorm (Jason Rusch), whose series Jolley was also writing at the time. It was part two of a story that started in Firestorm (2004) #7.) They’re adding an introduction by Kurt Busiek and an afterword by Ivan Cohen, editor of the series. Note that they’re also changing the last three issues. Originally, the bad guy was Zeiss, a Batman villain; now, he’s been removed/rewritten. The Robot 6 interview explains the title’s premise as well as the rights reversion that allowed Jolley to take the series to another publisher. (DC never seemed to care about it, anyway.) 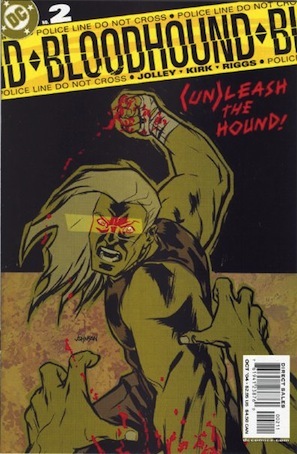 After Firestorm and Bloodhound were cancelled in 2005, Jolley pretty much disappeared from comics, but I’m hoping that calling the book Volume 1: Brass Knuckle Psychology implies that we might see more in future. Digression: Wow, the world we’re living in now. I did a quick Google Discussions search to find my old Usenet mentions of the title, and I turned up reference to a graphic novel called Creased. Sounded interesting, so I popped over to my library’s website and placed an ILL order. When it’s ready at my local branch, I’ll get an email. Reading comics is so easy these days!